KeyProwler allows you to record and control everything that happens on your computer and have it delivered to your email address daily - including applications used, time stamps, clipboard data and screenshots of the computer activities! KeyProwler is truly an all in one keylogger solution. Start automatically watching every chat, monitor every website, and control it all easier than any other spy software on the market. No other spy software gives you the security of knowing you will be able to collect every screenshot and every keystroke with just the click of a button. Every keystroke from popular chat, online email and social sites is recorded. Including Myspace, Facebook, Hotmail, Yahoo Messenger, MSN Messenger, AIM and any other programs, in addition to any website or program that is used. When people want to download a quality keylogger, they turn to KeyProwler! Unlike other internet monitoring software, KeyProwler can't be noticed or uninstalled the typical way (Windows Add/Remove Programs). Upgrade to the Pro version to use Stealth Mode, making KeyProwler 100% hidden, guaranteed. With simple one-click keystroke logging set up and access, KeyProwler Keylogger is perfect for the novice while giving extended tracking power to the IT professional. Imagine being able to know every single thing that happens on your PC. Use KeyProwler for FREE! 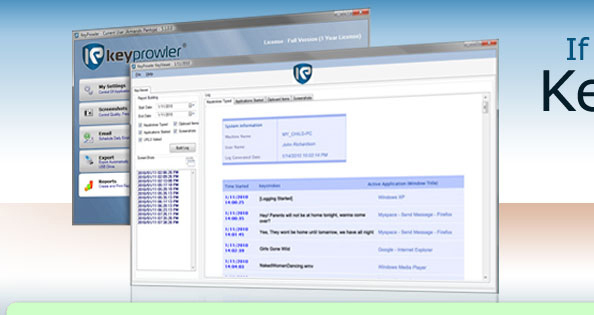 "KeyProwler is a serious PC monitoring and keylogger application. Since I don't have a spouse, and my children are too old to monitor their Internet usage, my primary purpose in using KeyProwler is monitoring employees access to the Internet,employees who insist on breaking the rules I have established for Internet usage. The keystroke recorder feature has been very effective as a deterrent in this respect."